Indie Royale marches in with the July Jubilee Bundle, featuring ten independent games - valued at over $50 - for a bargain, fluctuating price of around a tenth of that cost! First up is a super-smart indie adventure with a puzzle twist: Telltale Games' Puzzle Agent. 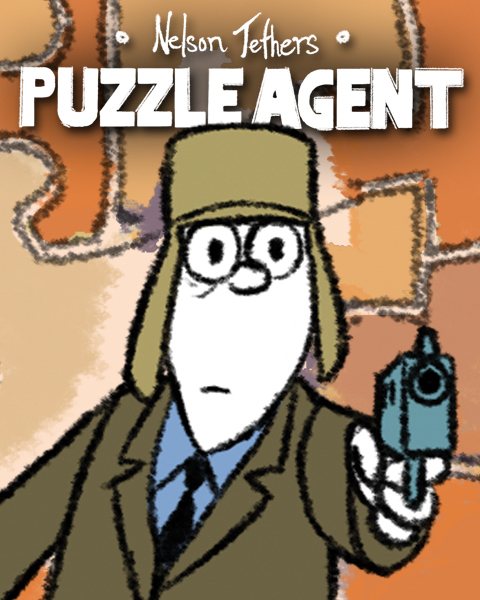 Downloadable for Windows and Mac on Steam, Desura and DRM-free, this game uses indie comic creator Graham Annable's unique art style to reveal FBI Agent, Nelson Tethers, who is on his first mission for the U.S. Department of Puzzle Research. Check out the game that AdventureGamers dubs "a charming lite adventure filled with quirky characters and challenging puzzles that anyone can enjoy solving", featuring 30+ puzzles spanning math, logic and spatial thinking. Next up are five old-school, open-world RPGs brought to you by Spiderweb Software: the Geneforge Saga, now available for Windows on Steam and Windows and Mac on Desura and DRM-free. Set in an alternate sci-fi/fantasy universe, DIY Gamer explains of the old-school RPG: "The whole series is very highly regarded, with each game giving you a rough overarching goal, but lets you go about it however you see fit, developing your own character and your personal squad of mutant minions to tackle the challenges." So what are you waiting for? Also offered in this bundle is a much buzzed-about 2D platformer inspired by 8-bit action games from the NES era: Oniken, available for Windows on Desura and DRM-free. Play a ninja named Zuku as you slash and hack your way through a dystopian future and battle a dominant military organization of cybernetic warriors known as the Oniken. Offering uber challenging boss fights, a campy sense of humor and great old school 8 bit music, this game can't be missed. Destructoid celebrates Oniken for its presentation: "Oniken feels like a project holistically designed around one person’s love of '80s action film and '90s anime imports." Included in this bundle is Pom Pom's critically acclaimed psychedelic shmup Mutant Storm Reloaded available for Windows on Steam, Desura and DRM-free. Offering over 89 (!) levels of frenetic fun, each level starts off easy, but quickly works up to large, tentacle creatures and regenerating enemies that are require skill to beat. You can't miss this game, recognized by Eurogamer for being "thrilling, constantly surprising, and possessed of a wonky beauty that makes it unforgettable. ... It's a bit like finding yourself in the midst of a parasite disco staged within the womb of a jelly baby." Also "marching" in this parade of great indie games are two games from Sophie Houlden: Swift*Stitch available for Windows and Mac on Desura and DRM-free and a bonus game that was created during the Indie Buskers game jam: Rose and Time available for Windows and Mac as a DRM Free standalone. Swift*Stitch offers a plethora of levels, and this game challenges you *not* to press buttons to power your ship but to press the right buttons at the right moment to make it to the end of the maze. Included is a trancelike soundtrack from Aeronic that nicely contrasts to Swift*Stitch's razor-focused play. Also included is Rose and Time, a clever time travel stealth game offering ten levels with a catch: you have to make sure the past you doesn’t see the present you, because that would create a paradox. Rounding out the bundle is Francisco Téllez de Meneses' labor of love, Unepic available for Windows on Desura and DRM-free. Unepic cleverly combines an RPG with a platformer and offers a quirky sense of humor throughout. Play as Daniel, an average gamer/geek who gets teleported to a fantasy castle while using the restroom during a D&D Game. Destructoid calls Unepic a "unique gaming experience" suggesting that this game is definitely worth a try if you "enjoy running around in castles, jumping around platforms and figuring out the best way to slay monsters." Also available to July Jubilee Bundle purchasers are the "Royale Ring" (offering extra health and experience in each game) and 100 "Unepic Credits" (available via a downloadable key) that you can use to grab special in-game items. Finally, those who pay $8 USD or their currency equivalent during the July Jubilee Bundle will get 'Insert' from Japanese chiptune legend Prof.SAKAMOTO, a $7 value on its own. This clever concept album, about a future where inhabitants have game cartridge slots on the top of their heads, comes from an artist also famous for his unique Final Fantasy piano performances on YouTube. Don't forget that Indie Royale just launched its Collection feature. This is a page where Indie Royale purchasers can earn loyalty rewards, manage keys for already-purchased bundles, and add already-completed bundles to their Wishlist for possible bundle reappearances! More info on the Indie Royale Collection is available via this blog post. More information on the July Jubilee Bundle, including real-time statistics and its current price, is available at its official website or via its Facebook and Twitter pages. And a final reminder - the people who buy, the more the price will go up, unless kind buyers drop the price, so grab the bundle now! Why is this labeled as indie?